1. Want to avoid renaming multiple points? SA allows you to rename points by auto-proximity or inter-point distance. Simply look under the Edit command, near the bottom. 2. Need help organizing your point groups and making sure your measured point names match up with the nominal points you are inspecting? Take a look at the features available in the Automatic Measurement Tools. These functions will automatically name your shots to match up with the nominal points you are measuring and will give you information on the location of the measured point to the nominal as you measure. 3. There is a nifty little icon in the default Main Toolbar that is a dashed square. 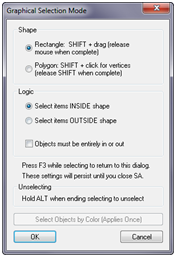 This is used to set the Graphical Selection Mode when you would like to pick multiple items graphically instead of picking them from the tree or from the F2 listing method. You can utilize this command to make your trap window a rectangular or polygon shape. 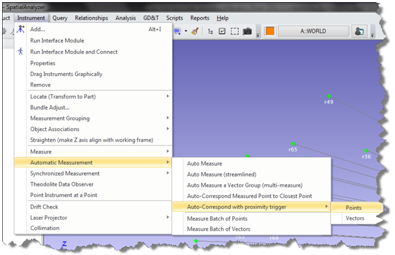 Using a polygon shape enables you to use a bit more precision when picking multiple items from the graphics window. It can also save time when you are selecting points for creating geometry or any operation that allows multiple selections. Just be sure to hold down the shift key before you left-click or you’ll wind up zooming in on the graphic. Also, when you release the shift button you have the opportunity to left-click on any point or object to unselect.